Ideally located,very peaceful,with a large terrace facing the mountain ste victoire( painted by Paul Cezanne). 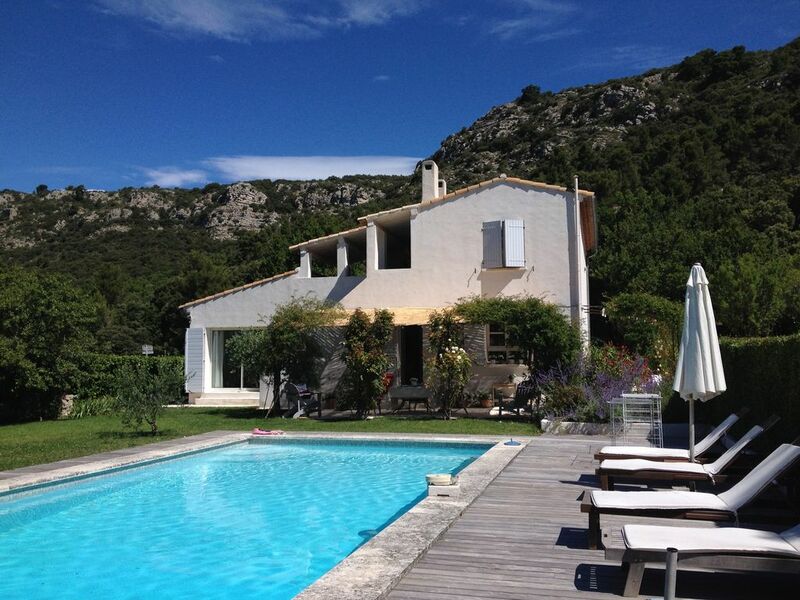 The village (250m from the appartment) of Vauvenargues is known for the Chateau de Picasso, Pablo Picasso is burried on the grounds of his prestigious castle - Also many hiking and biking trails - we are 15km from Aix en provence - - Real countryside. If you want to enjoy some peace and quiet in beautiful surroundings, then you could not choose anywhere nicer than here. The apartment is spotlessly clean and very comfortable, and we especially loved the outside area, perfect for long lazy breakfasts. The pool is wonderful - I swam at least once every day - and the garden full of birdsong and the scent of roses and lavender. The local village is pretty, with one nice little restaurant and a bar, and a shop which is great for everyday essentials (get there early if you want breakfast croissants). It's only 5 minutes walk. We really enjoyed exploring the local area, both on foot and by car - a car makes life much easier, though you're right on the bus route into Aix-en-Provence. Our hosts Francois and Lara were charming, and very helpful at all times.- we even discovered a mutual acquaintance in Canada - it's a very small world. Our only problem was the French ATC strike which made getting home interesting, to say the least - Eurostar from Marseilles and a 34 hour trip instead of a short flight to Bristol and a drive back to Wales! We stayed here for 11 days and can honestly say we loved every single minute of it! We hope to come back.. The area is stunning and well placed to get to Aix, Cassis Marseille etc. We took a bus into Aix which was so easy. Everyone so friendly and helpful in the village, we felt at home..we joined in with a 'big band evening' and so much fun. Francois and Lara are such lovely people and very helpful, nothing was too much trouble. Amazing time in a stunning area...!! Wir haben zwei wunderbare Wochen dort verbracht und es sehr genossen. Die FeWo ist nicht zu geräumig, ist aber mit viel Geschmack und Liebe eingerichtet. In der Nähe befindet sich ein schöner kleiner Ort, in dem man die wichtigsten Dinge einkaufen kann. Spaziergänge und Wanderungen kann man gut vom Haus aus unternehmen. Nach Aix-en-Provence sind es 15-20 Minuten mit dem Auto. Vielen Dank an die Gastgeber, die uns hervorragende Tipps gegeben haben und sehr gastfreundlich waren! Le logement est situé dans un endroit magnifique. La propriété est très bien entretenue. Les propriétaires sont adorables. Nous comptons y retourner un jour. Je commencerai par évoquer l'amabilité et la gentillesse des propriétaires Lara et François. Ces derniers nous ont très bien accueilli lors de notre arrivée dans l'appartement situé au dessus de leur maison. La vue sur la Sainte-Victoire et la vallée est juste sublime sans parler de la proximité du village de Vauvenargues où se niche l'imposant château de Pablo Picasso, sa dernière demeure. L'appartement est spacieux, très propre et possède tout le confort requis. Sans parler du calme des lieux. Nous avons été chaleureusement accueillis par Lara et François. L'appartement est joliment aménagé, la maison et les alentours sont magnifiques. Arrive in Aix-en-Provence and take the ring road around Aix (le peripherique) until you arrive at the Blv des Arts & Metiers - take a right - Continue straight until you arrive to the village of Vauvenargues (about 15 kms) - You will pass; Saint-Marc-de-Jaumegard & Barrage Bimont.